This noodle bowl is one of my favorite easy lunches - feel free to pre-dress the noodles and cabbage and pack it ahead. It keeps well for a few days in the fridge. In a small bowl, whisk together the miso, rice vinegar, tamari, and sesame oil until combined. Slice the segments from the orange, set aside, and squeeze the excess juice from the orange into the sauce. Divide the red cabbage among two to three bowls. Drizzle with some of the dressing and toss gently to coat. Place the cooked soba beside the cabbage in the bowls. In a skillet, heat a drizzle of olive oil and add the scallions and snap peas and cook, tossing until lightly blistered but still vibrant green, for about 2 minutes. Remove and add to the bowls. Add more olive oil to the pan and add the mushrooms and a pinch of salt and cook until the mushrooms are tender, about 8 minutes. 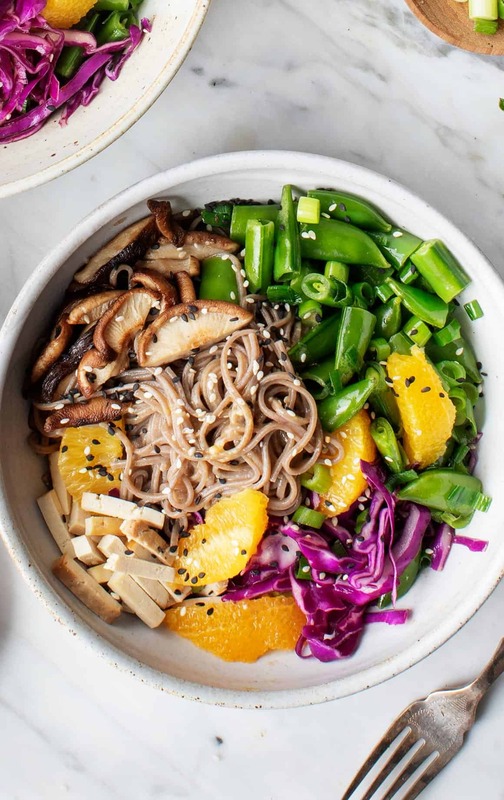 Divide the mushrooms among the bowls and top with the orange segments, tofu, sesame seeds, and herbs if using. Drizzle with a little of the remaining dressing and serve the rest on the side. (Note: the dressing is slightly on the salty side so a little bit goes a long way - add it to taste and save any extra for salads/bowls later in the week). *Cook your soba noodles according to the package directions. Drain and rinse them to remove excess starches. This helps them from clumping. If they start to stick together, toss them with a little bit of sesame oil. **To save a step in this recipe, I buy pre-baked tofu (I like the Wildwood brand). Alternatively, you can bake your own tofu. Start with extra-firm tofu, patted dry and cut into cubes. Preheat the oven to 425°F and line a baking sheet with parchment paper. Toss the tofu with the tamari and spread evenly onto the baking sheet. Bake for 15 to 20 minutes, or until golden brown around the edges.